Don chats with volunteer Kathy Vanaria about the vital work being done by Maine Lost Dog Recovery and how they can help you recover your pet if they go missing. 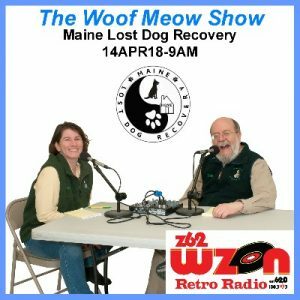 We discuss the mission of Maine Lost Dog Recovery, how they got started and how they have used Facebook and a network of volunteers to find, capture, and return lost dogs to their family. Tune into the show, and you will learn what to do if your dog gets lost as well as ways to prevent that from happening.